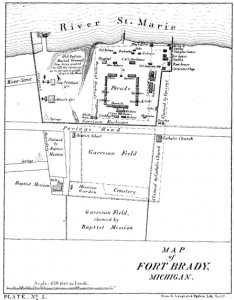 During Fort Brady’s history, it has gone through many changes. From a humble beginning as a small fort on St. Mary’s River to Lake Superior State University’s campus. Fort Brady was an active fort since it’s founding in 1822 until it was decommissioned as surplus in 1944. Due to the fort being active for that span of time, it changed locations to better defend the Soo Locks as they became crucial for transporting ore out of the Upper Peninsula. The first is commonly referred to as Old Fort Brady, the second is referred to as New Fort Brady and the third iteration is the grounds for Lake Superior State University where a lot of the buildings have been maintained. It was founded in 1822 and was used, at first, to halt any British invasions from Canada and to protect the locks. Hugh Brady founded (Old) Fort Brady shortly after receiving the rank of colonel commandant of the 2nd Infantry Regiment. This was shortly after the 22nd Regiment became consolidated. He fought with the 22nd Infantry Regiment during the War of 1812 and helped the United States claim victory in the Battle of the Chippawa and helped draw a stalemate in the Battle of Lundy’s Lane. The Battle of Lundy’s Lane was one of the bloodiest battles in the War of 1812 with about the same amount (around 900) of total casualties on each side. Here Brady was severely injured, but he still continued to serve in the military despite the fact. Colonel Brady along with the 2nd Infantry Regiment moved from Sackett’s Harbor in New York to Saint Marys River in the Upper Peninsula. It is a small gap to Canada, which is why it was important to station a fort right next to British occupied lands. It was not that impressive of a fort, but it was enough to enforce an American presence in the Upper Peninsula near a pseudo enemy at the time. Due to the fact that there wasn’t that much conflict in this fort, it really boosted the area around it. It may have not been a reinforced fort with brick and mortar walls, but it contained a grove and a cemetery. It earned Hugh Brady a promotion to Brigadier General. He left his fort around 1822 along with most of the soldiers to head to Fort Snelling in Minnesota. For about 20 odd years the fort was operational, but during the Mexican-American War the previous army occupied fort had to be manned by volunteers from Michigan while the Army regiments stationed there headed south. After the conclusion of the war, marked by the signing of the Treaty of Guadalupe Hidalgo, the Michigan volunteers up and left. They left the fort unoccupied, which raised concerns for the state of the locks. If by some chance an enemy could control or destroy the locks it would lock down and cripple the upper peninsula. The army came back in 1849. The were vacated in 1857 when the Army abandoned the fort to help quell hostilities happening around Fort Snelling. With no one occupying the fort and the locks being geographically essential for the copper industry it was a suspected enemy target. 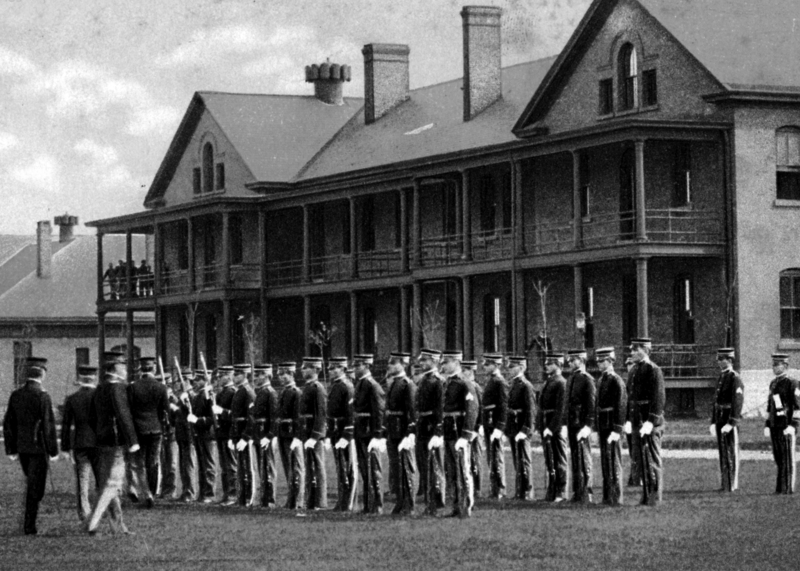 The Army got back to Fort Brady in 1866 with the sole mission of protecting the locks. There were remodeled buildings, but the main shipping canal through Sault Ste Marie that was overlooked by Old Fort Brady was widened . This meant there wasn’t any space for Old Fort Brady. So plans, material and capital were set to make a new fort upland from the now old location in 1886 by order of General Philip Sheridan who would gain notoriety serving under Ulysses S. Grant in the Civil War. As a matter of fact it was his cavalry that forced the surrender of Robert E. Lee at Appomattox. New Fort Brady would be completed in 1893. In the early turn of the century New Fort Brady was being built upon with newer buildings. During World War II there were about 15,000 troops stationed at New Fort Brady. There they learned how to be effective soldiers in harsher colder climates. Their training included long distance skiing in full military gear and snow shoe training. Around 1944 is when New Fort Brady became what a lot of the older forts became: surplus. Surplus essentially means that the military no longer has use for what is surplus. The Army moved out and it became grounds to be donated, bought, and preserved as a surplus fort. With it’s new status, the fort was sold to the Michigan College of Mining and Technology. In 1966, Fort Brady became the site of the Lake Superior State College of Michigan Technological University. The college separated and became Lake Superior State University. Some of the original buildings are still used today as part of LSSU’s campus. 6 “Fort Brady.” Lake Superior State University, www.lssu.edu/fort-brady/. 7 “The Twenty Second United States Infantry” Https://Journals.psu.edu/Wph/Article/ViewFile/2876/2708 .